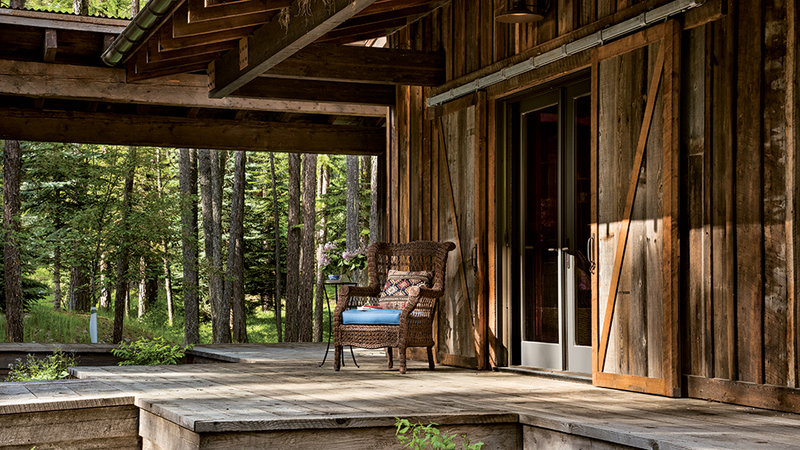 Comfortably settled amidst the pines near a Whitefish Lake subdivision lies a beautiful barn-inspired residence. 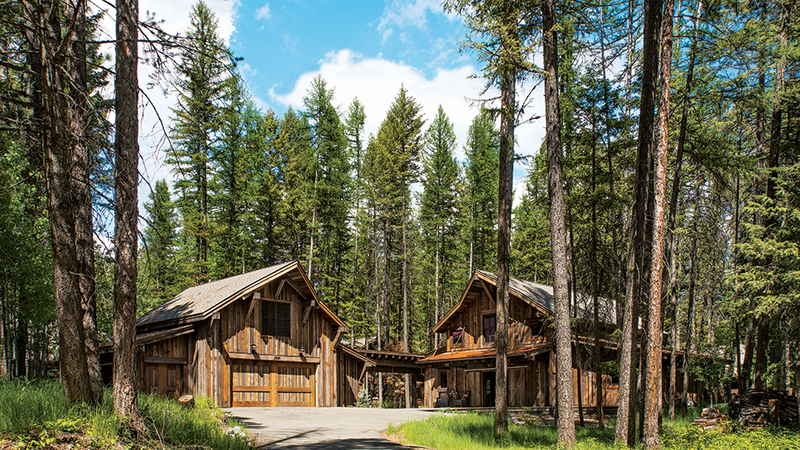 At first glance, one might easily assume the timber home was part of the Montana development’s original homestead, perhaps remodeled from an old outbuilding. With this thought, you’d be wrong … but only partially. The 2,400-square-foot, two-story home with a deck, screened-in porch, first-floor master suite and enclosed loft is a new build. More accurately, it’s a newly conceived structure made primarily from repurposed materials. 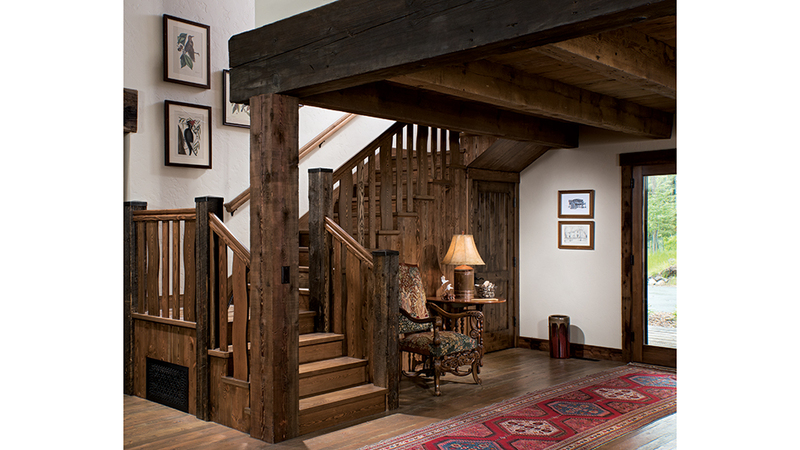 For homeowners Frank and Geraldine, the barn heritage was a perfect fit. They had always found beauty in a barn’s structure and purpose. “It’s that practical use for animals and storage. They hold a story we appreciate,” reflects Geraldine. It was up to architect Keith Beck of KBArchitecture to adapt a traditional barn style into something with a lighter feel, suitable for living. “Everything is based on proportion. 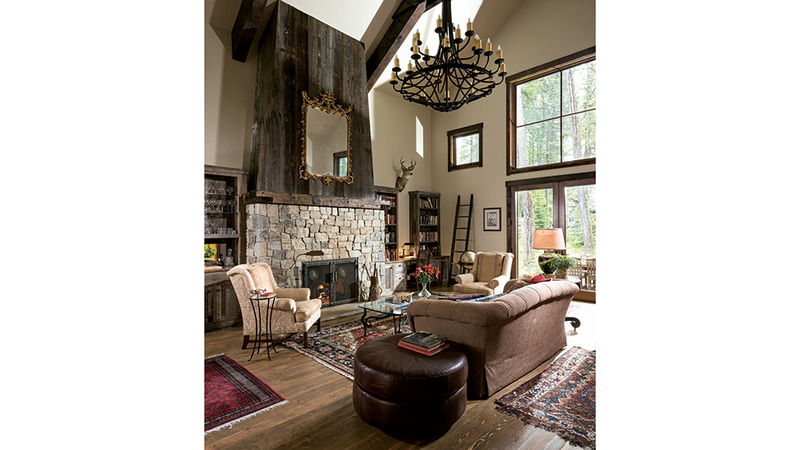 It’s spacious vertically, but the substantial timbers and trusses fill the volume. It has substance,” says Keith. Turning this unpretentious style into a home demanded extraordinary skill. Brad describes incorporating older pieces into the new form as a puzzle. He sought timbers with interesting character and beauty, while being large enough to be structurally sound. Additionally, he insisted on brown tones rather than the more common weathered gray. Timbers, siding, roof, decking and much of the cabinetry are all reclaimed wood. 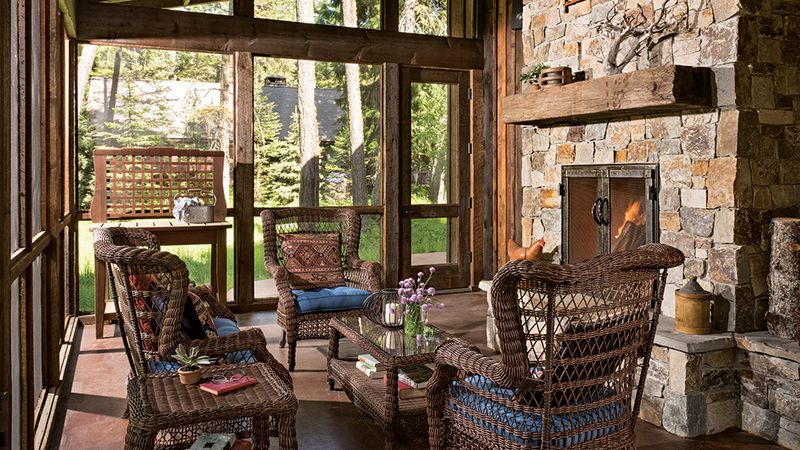 The indoor and outdoor wood-burning fireplaces are made of locally-sourced stones from a hot springs area. A few are adorned with lichen. 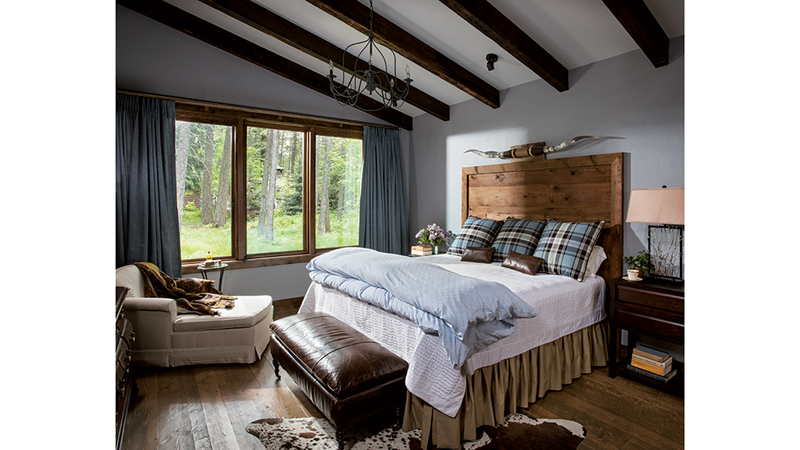 Sliding crossbuck barn doors were custom made onsite. 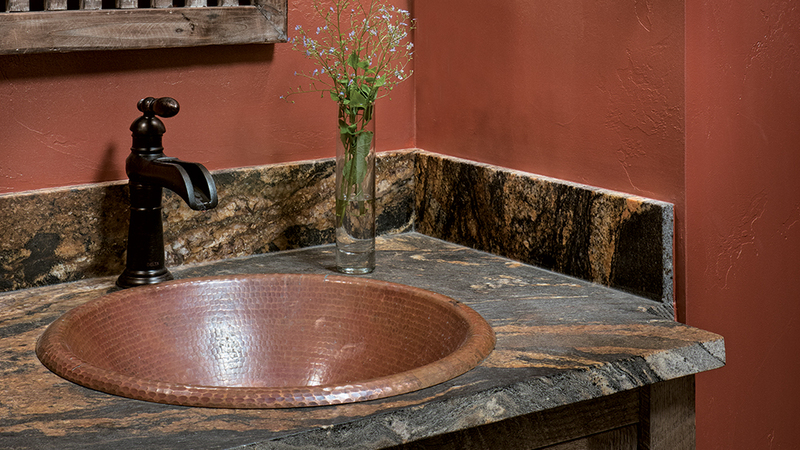 The exposed sliding track hardware contributes to the home’s functionally-styled patina. Energy efficiency was also key. Foam insulation was installed under the siding and framing. The two main exterior entries are paired doors: an insulated, clad interior set and a secondary, external sliding barn door. The reuse theme extends to the interior. 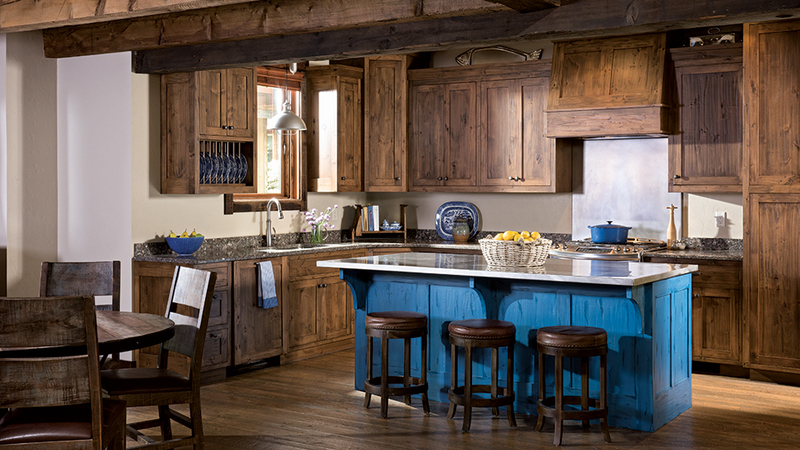 Custom-crafted cabinetry is a mixture of new and salvage. Reclaimed pieces include the built-in desk, ladder and kitchen island, milk painted in a cerulean blue. All appliances are clad with wood to harmonize within the space, and the finishes and hardware blend seamlessly with old and new wood. Windows that soar to approximately 16 feet high anchor the great room. The abundant natural light emphasizes rustic details, such as worn remnants of light green paint on the main support beam that was sourced from a granary. Each room contains furniture from Frank and Geraldine’s previous, more traditional home. “These pieces respect the dignity of the craftsmanship. Many are reupholstered but assert their own formal style. It’s like having an old friend in each room,” Geraldine says. 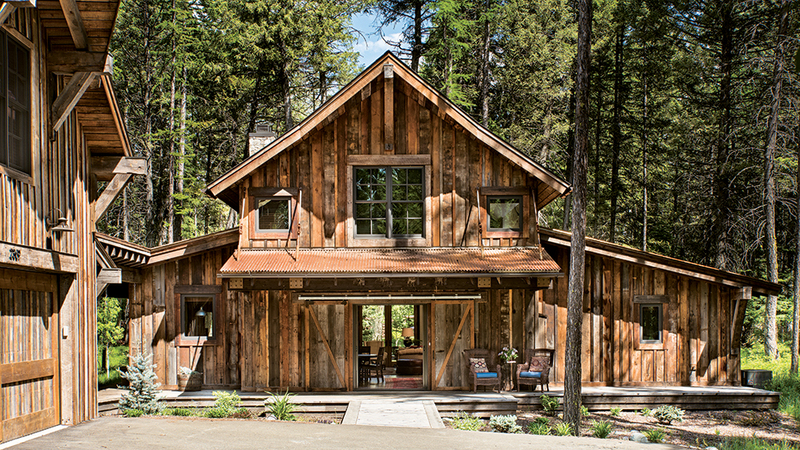 Despite being brand new, the home radiates the warmth, comfort and security of a house that’s been in the family for generations and shares a kindred spirit with its rich Montana heritage. The great room’s expansive space and windows delight the homeowners with displays of natural light that change in tone throughout the day. Geraldine did all the interior design work for the home she shares with her husband, Frank. She used a cheerful cerulean blue to add bursts of color, such as the kitchen island’s reclaimed wood, milk-painted base. 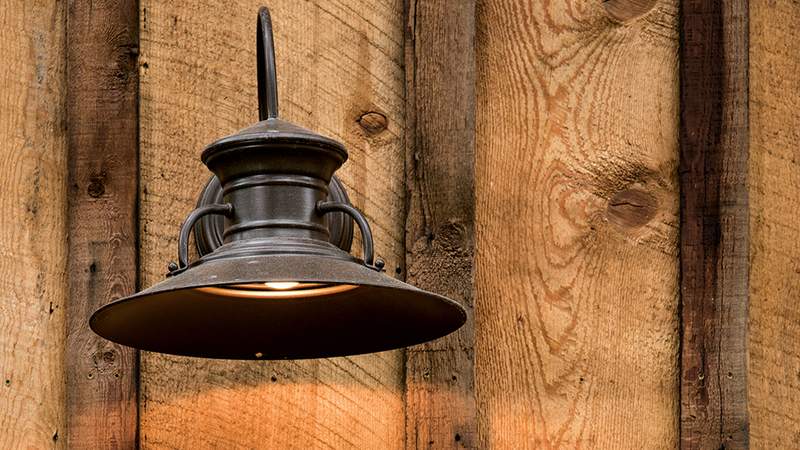 Details like rough-sawn wood wainscoting and gooseneck lanterns are what make farmhouse style come to life. 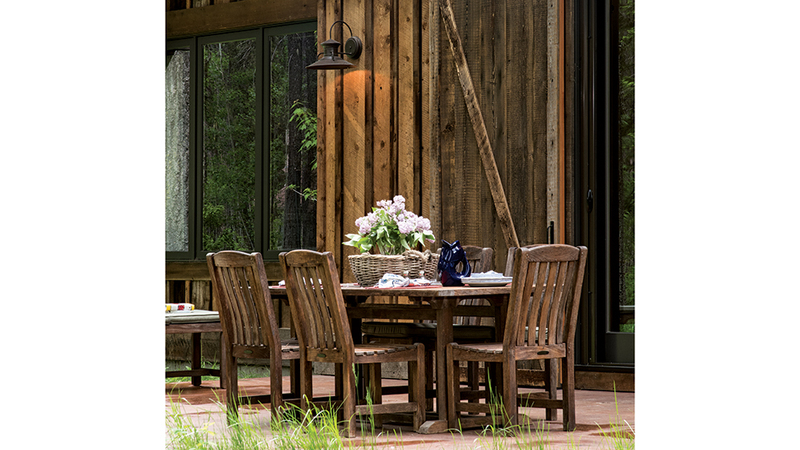 A low-profile deck doesn’t have railings, allowing unobstructed views of the quiet woodland surroundings. The guest bedroom takes on a softer feeling, with its cornflower blue palette and soft linens. However the farmhouse style is still evident in the chocolate-brown beams overhead. The repurposed posts still show the markings and notches from their former structures. The screened-in porch with fireplace is a favorite spot and provides a cozy space to enjoy being outdoors from spring through late autumn.